This Stow High School 1964 class reunion group photograph was taken at the Sheraton Suites Akron in Cuyahoga Falls. 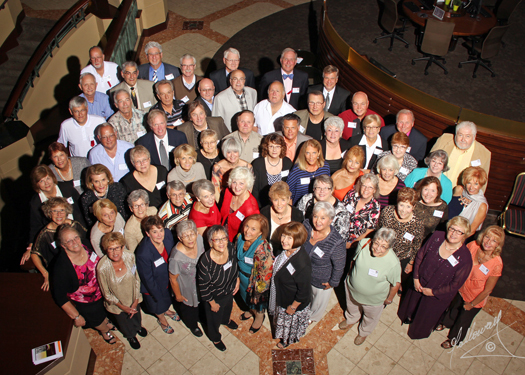 We will be building a modern class reunion yearbook of the event, including all of the portraits we did of the individual classmates/spouses, this group photograph, and a collection of candid shots from the weekend. We hope you like it, we had fun shooting the event. FYI…We shot it from the first floor balcony with an 800 watt second off camera strobe/flash that is bright enough to carry the focus of such a large group; ISO 125, shutter speed of 125th, aperture f/10, PocketWizard radio control sync to fire the flash. Nothing all that tricky, just solid fundamentals.